Auto Replier: Got a call? Got a text? In a meeting? In class? Driving? Be Cool! Keep your contacts in touch by using your very own custom auto-reply messages or use one of the up to 52 preset messages that are provided. 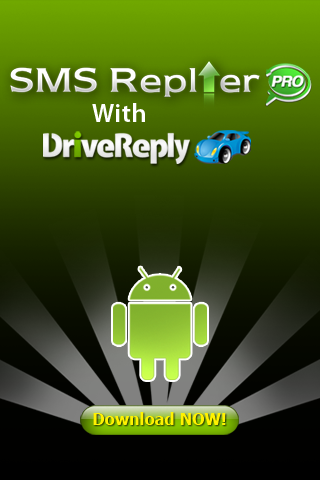 Drive Reply: With SMS Replier’s Drive Reply feature, being a responsible driver has never been easier. Texting or using your cell phone while driving is not safe, period. The NHTSA has reported that in 2008, early 6000 people died and more than 500,000 automobile accidents occurred as a result of texting while driving or similar activities. The convenience of Drive Reply allows all your text and phone calls to be replied back with a driving response, letting the person know you are driving at the moment and will get back to them when you have reached your destination. Customizable: What application would be complete without offering the flexibility to make changes. With SMS Replier creating, editing, and prioritizing your Auto Reply messages has never been easier. In meeting? 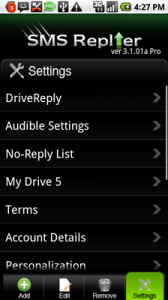 SMS Replier automatically silences your phone while you are in your meeting or driving. DriveReply – Movement and speeds of 15mph or greater engages DriveReply to auto-reply for you so your contacts do not go ignored. Text & Call Auto-Replier – SMS Replier captures your inbound calls and text messages for you, sending a custom auto-reply while driving, movies, in class, etc. My Drivie5 – For those in your inner circle that just have to get thru! Personalization – Hi MOM, I am sorry you caught me driving,…; Hi Arthur, I am in a meeting. No-Reply List – No auto-reply to numbers you wish to not send replies. SPAM Filtering – Enhanced SPAM and shortcode filtering to protect your identity. SMS Notification – You know what SMS Replier is doing for you, when. Free Upgrades – SMS Replier provides unlimited updates / upgrades for 1 year from purchase date. Battery Notifications – SMS Replier is now up to 90% more battery efficient! Have your phone notify you when your battery reaches 20% or below. SMS Replier does not need it, but you might!